9:00 am. Bella wakes up, begins yelling "Mama wake up! Mama, Bedda waked up! Mama get Bedda!" in a sing-songy tone. 9:15 am. Bella pops up in bed when Mama finally arrives to get her out of bed. She yells "Hey, Mama! Wan go pway?" 9:20 am. Bella has Mama sitting in the floor playing with a spinning turtle that sings "Can't Hurry Love." Bella angles her legs so the turtle's legs brush against her as it spins. Bella squeals "Dat turrel getted my wegs! Why you do dat turrel??!!" Then she realizes she has no milk. "Where my meeyelk, Mama? You get it Mama!" 9:30 am. Bella and Mama come downstairs for milk (and coffee and maybe Thomas will distract her until I can make some coffee). Mama turns on Thomas. Bella sings along to the Thomas theme song, "Go-way Thomas, Go-way Thomas, Go-way go-way pway Thomas!" and then turns the tv back off. 9:31 am. Mama turns the tv back on. Traps Bella in her portable seat and offers a handful of Apple Dapples. Bella demands, "No my seat, Mama! I no want dat cereal (seer-ree-ear-ree-uhl)! I no want it!" as she knocks the cereal off her tray. 9:35 am. Mama sits down with a bowl of ceral. Bella screams "Dat's mines, Mama!" as she climbs into Mama's lap. Bella then steals Mama's spoon and eats all of Mama's cereal. 9:40 am. Mama wipes off Bella's hands and face. Bella then demands, "Wipe-a my ahms! Wipe-a my wegs!" Therefore Bella gets a full-body wipe down. 9:45 am. Mama tries Thomas again. Bella firmly says, "No, Mama, no want dat Thomas." And turns the tv back off. 9:50 am. Mama wakes up Daddy. Mama gets big cup of coffee and hides from them both. As Bella continues picking up more words, she's begun using "adult" phrases and asking questions that surprise me with the amount of logic and problem solving required. I am astounded by her not only because she's amazing, but also because her brother was nowhere near as vocal or inquisitive at her age. 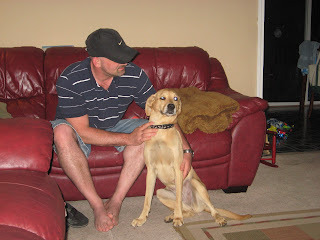 For instance, yesterday Daphne went to live with her new family. 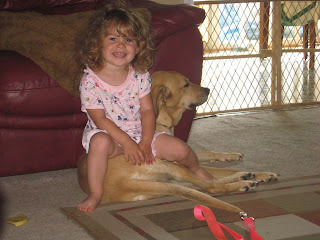 We really didn't prepare either child to lose the dog because it happened quickly. So, Javi gets home from school and notices nothing different until I tell him that Daphne went to her new family. Bella gets home and immediately starts yelling, "Where pup pup?! Where pup pup go?" I told her that the puppy went bye-bye and she just rolled her eyes. Then she began her quest to find the dog. "Pup pup go night-night!" 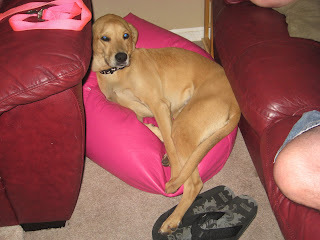 she squealed as she ran to the spot between the couch and love seat where Daphne loves to curl up in Bella's pink beanbag. But there was no pup pup. And on it went. "Pup pup go outside?" "Pup pup in the house?" "Pup pup in the car?" "Pup pup go potty?" To each questions, I told her gently, "No, Bay. The puppy went bye bye." But I was impressed by Bella's ability to consider all the options for where the dog might be hiding, and how she wouldn't give up the search until she'd exhausted all of those options. She also seemed to be considering clues. Just when she was on the verge of giving up, she'd spot the dog bowls with water and food in them or the chew toy in the middle of our bedroom floor and her enthusiasm for the search would pick up again. But the question "Where?" isn't a new one in this house. She's been asking me where things are, when things will happen, and why not for a while now. When we tell her it's time to go to bed, she'll ask "Where my blanket?" When I'm cooking she'll ask, "When dinner team? When we eat eat?!" And the one that strikes fear in the heart of every parent: Why? "C'mon, monkey, let's go." "Why mama?" Ah, yes. The eternal why. As impressed as I am by Bella's inquisitive little personality, I am really hopeful that we still have another year or so before the Why reaches epic proportions. I'm still recovering from the Great Why of 2003 when I began hiding from Javi to avoid having to answer Why for hours. Child: Mama, why is it hot in the summer? Mama: Because we're closer to the sun. Child: How can we be closer to the sun? Mama: We live on a planet and during the summer it's closer to the sun. Child: Why is it closer? Mama: I don't know, baby. Child: What do you mean you don't know? Mama: I just don't know. That's why you should go to college. So you can figure it out. And with that, the line of questioning is stopped until the next one pops up five minutes later. Try it - it's fun! In the meantime, I'll enjoy my Bella's little mind as it matures and she continues thinking and reasoning her way through the world. We've been all over the map the last few days, from Relay for Life to the lake to visiting with friends. 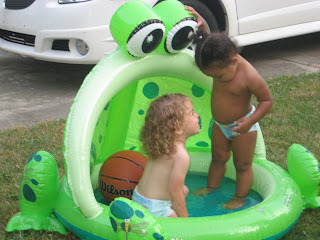 Both of my cutie pies are growing up so fast! Bella had picked up a mean little saying that goes like this: SHUDDUP! SHUDDUP MAMA! SHUDDUP JAVIER! SHUDDUP! I take all the blame because I snapped on Javi at the dinner table a few weeks ago when he just wouldn't be quiet, kept talking over me, kept making loud noises, and other annoying stuff. My brain melted for a second and it just came out like a demon: SHUT UP! And he did. I think I shocked the pants off of him and he was quiet for a good 4.5 minutes before it all started back up again. However, the lasting effect was Bella's new saying -- and say it she did. I don't think she knows what it means, but she likes to yell it when she wants our attention or when we're doing something she doesn't like. Therefore, it's quite effective. But yesterday she started saying something else: BE QUITE! Yes, that's how she pronounces it. I'm guessing she hears Be Quiet a lot at her school and I'm sure I say it a fair amount. I'm always trying to get Javi to stop talking, lower his voice, use his inside voice, pleast be quiet, can you stop talking for 5 minutes?, it's quiet time, hush!, we're not talking right now ... you get the picture. So I actually don't mind hearing BE QUITE JAVIER! or BE QUITE MAMA! because it's so much nicer on the ears than SHUDDUP! My sister has had my camera since May 15 ... which means I can't remember anything that's happened in the past 13 days because there is no photo documentation of it. And I have no idea when I'll get my camera back!!! I did want to make a few sweet baby sticky notes. I think the sticky notes will replace my letters to Bella since I've felt such a relief since I stopped writing them. 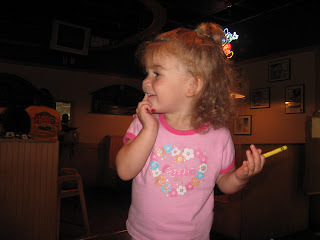 But I don't want to forget a moment of the good stuff that is the toddler years. 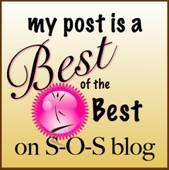 So stay tuned for my stickies! And tell Ashley to bring back my camera! My husband refuses to take his shoes off in the house. Anyone have a suggestion for changing this nasty habit? He used to keep them on because he was always tromping outside to smoke, but he's been smoke-free since February. So leaving his shoes on is now just a bad habit that I can't seem to break. I've tried making a point of taking everyone's shoes off. I've tried asking him to take his off. I've left his flip flops by the door so he will see that he has shoes if he needs to the leave the house ... but none of it has changed him. And he really doesn't leave home again once he's here. He got home at 4:30 pm today and it's currently after 7 pm and he's yet to leave the house ... even to run out to the car. Billy and I want to put our house on the market next spring ... which means we have less than a year to get it into selling shape. -- Replace the floors. We still have the fugly linoleum and the wrinkly, loose carpet that the previous owners put down. Also, the lino in our bathrooms isn't level with the hallway floor. So we have to correct all of that. We're planning to use "floating floor" for the kitchen and bathrooms and either hardwood laminate in the living room or recarpet. However, we'd have to recarpet the whole house to match. Ugh! -- Landscape the yard. When we moved in, the yard looked great but it slowly began falling apart ... and we realized that just because something looks good doesn't mean it was done well. Our yard was full of sawdust ... which left dead spots, and the front beds were a wreck. I can't even explain the weird humps they landscaped in the back. So we've already leveled out the back, now we just need to remove a rampant vole population and fix the front. But it has to be done! -- Repaint the house interior. We chose a lot of vibrant, bold colors for the house, but I know not everyone will want them. We're planning to redo all the walls with the same khaki (or some variation thereof) color ... which means bye bye yellow kitchen, blue bedroom, taffy living room, and sage green baby room. Javi will be happy because he's always hated the landscape/sky pattern we painted on his walls! -- Repaint the house exterior. We had big plans to put vinyl siding on the house, but I've decided I don't want to invest that kind of money when we have no idea if we'll make the investment back on the sell. With the market the way it is, we may barely break even! So, we're going to repaint the house the same charming yellow but change the shutters and doors to blue or maroon. Probably blue. I'm tired of the hunter green! And presto-chango! We'll be ready. Just making this list made my head hurt, but it needs to be done. I'm happy that at least the attic's been cleaned out. That's one less thing to worry about! Three years ago today, we were preparing to face the unknown together. As two adults who grew up witnessing extremely rocky (perhaps horrible) marriages and even worse divorces, we knew that marriage isn't the end. It's not the fairy tale "happily ever after." We knew that marriage was the beginning ... of the hard work, the sacrifice, and the overwhelming rewards that come from sharing your life with someone that your trust all the way to your core. We also knew that our marriage would herald another life-altering event: a baby. After dedicating our lives to each other for four years, we decided to take the leap. So there we were on Saturday, May 20, 2006 -- so nervous and yet so excited to be stepping onto this scary and beautiful path. I hope you always know that I'm so happy you decided to take this walk with me. That we trusted in each other enough to shirk those roles we watched our parents play and instead have faith in each other. That was three years ago -- seven years from the day we first decided to make our way in the world together -- and I am as lucky, grateful, and proud to have you as my life partner now as I was then. In fact, my love and admiration has only grown as I watch you be an amazing and inspiring father to our two wonderful children. If God had allowed me to shape a husband for myself or a father for my children, you are the man I'd create. The camper and wakeboarder are self-explanatory, but I chose orange because a) it goes well with many other colors (such as Billy's hunter green jeep and our blue and white boat) and b) Billy's from Tennessee. You know he's a Vols fan! After a long day of school, Bella often needs quite a bit of coddling and patience from us when she gets home and in the hour or so leading up to dinner. 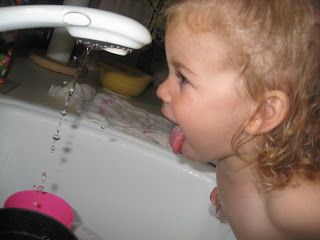 So last week I decided to let her pull a chair up to the sink and play in the water while I cooked. 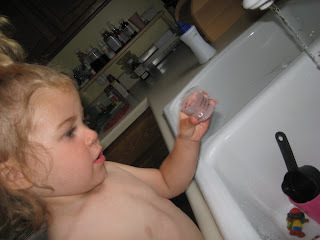 She had a blast, but everything around her got soaked ... and she still required constant supervision as she kept trying to pour water from one measuring cup to another while the resting one was on the counter ... despite me telling her 18 million times to keep the water in or over the sink. 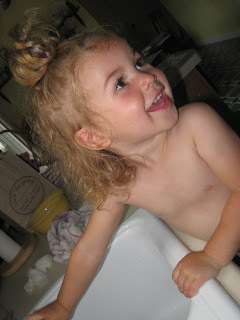 Also, we have a very deep sink, so she had a hard time playing with the cups and toys I tossed in there for her. All in all, she had fun, but this isn't an activity that will keep her occupied while we work around her. And now every time we let her in the kitchen, she grabs a kitchen chair and tries to push it to the sink. 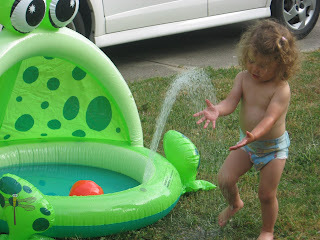 When we stop her, she dissolves into a snot mess while screaming "Me play water!" at the top of her lungs. It's hard being 2, isn't it?! What a long week or so it's been. Between three back-to-back deadlines and preparing for my town's Relay For Life event, last week was a bust. Then I spent the weekend recooperating and scrapbooking with friends. I love the two layouts and one card I made ... but my sister borrowed my camera so I have no photos to show off. However, life with the children steamed on full speed ahead. Bella learned to play hide and seek last weekend. 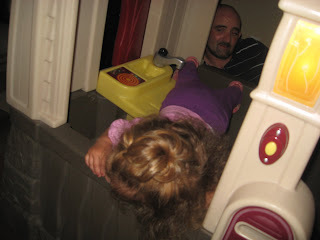 Well, it was a form of hide and seek that required her to get her head under the table in time to see Javi before he popped back up. She would've played it for hours had I let her! I hope we don't miss out on other super-cute baby moments while Ashley is holding my camera hostage! When we first moved to our house back in 2005, we loved that there were no trees in the front yard. Most of the homes in our neighborhood are on heavily wooded lots, which means they deal with more acorns, leaves, and bird poop than I care to think about. However, it also means they have much more shade to help keep their homes cool during the hot summer months -- and they have tons more privacy than we do. So after about a year, Billy took his friend Jeff up on the offer to dig up one of the magnolia seedlings sprouting in Jeff's yard and transplant it to our yard. I was skeptical about how well that would work, but figured I'd sit back and see what happened. Billy decided to position the magnolia tree so that when it was full grown, it would obsure our front door from the street. So that was in spring 2006. 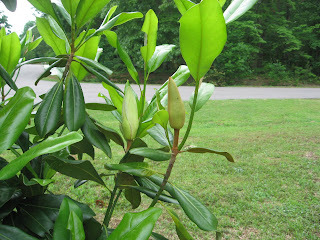 We are now full force into spring 2009 and we finally have buds on the magnolia! The first year (2006-2007), it really just took some time to determine whether it liked us. Then (2007-2008), it decided to grow a foot or two and thicken up some. This past winter, it began shedding leaves like a real tree ... and then today we discovered the buds. I think Billy and I were both shocked that the damn thing is finally blooming after three years of tending it! 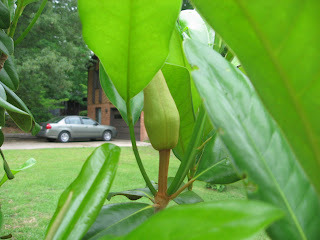 I'll share more photos as the buds become full blossoms. I hope they're gorgeous since we've been waiting so long for them! I woke up slightly disappointed that it was 8:30 am and both children could be heard whining in the living room. So much for sleeping in ... so I stumbled out of bed and went to investigate. My disappointment was soon replaced by joy because sitting right on the counter waiting for me was a handmade card from Javi and my new CRICUT! Of course I wanted to immediately make something, but the kids needed special attention. 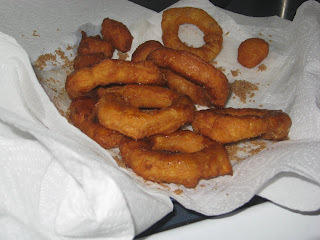 Billy was trying to make coffee and omelettes, so I dismissed him to entertain Bella and enlisted Javi in an even better breakfast: homemade donuts! We used to make donuts all the time when I was kid, but this is the first time I've bothered with it in probably 15+ years. I'm not sure why except that I hate disposing of the oil ... and I'm not a big donut fan. But it's a fun activity to do with Javi, so we delved in. I popped open a can of womp biscuits (what Billy's family calls canned biscuits), flattened them out a bit and then used a small medicine cup to punch out a hole in the center. We heated up some Canola oil until it sizzled when I flicked a bit of water in the pot. In went the donuts! Javi was fascinated and shocked by the process. I think a big pot of hot oil sent off all the alarm bells from his fire-safety training. 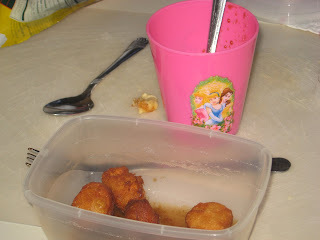 :) But after a few minutes over the pot, we had a batch of crispy soft donuts and donut holes! 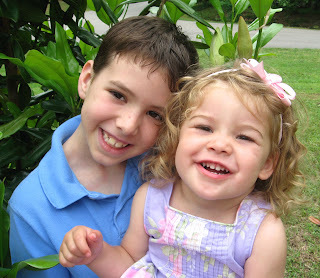 After breakfast, we got the kids dressed and took them outside for a little photoshoot, which was both painful and fun. Painful because the children don't like to be corralled and fun because we got some good shots. We're using the best ones in our Mother's day craft for the grandmothers ... which I need to help Javi make while Bella naps! I hope every one had an equally fantastic and surprising Mother's day! There's nothing better than celebrating Mother's Day when your children are old enough to present you with gifts that come from their hearts. Bella is clueless about the holiday, but Javier isn't -- and he's chomping at the bit to give me the gift he made in class this week. I imagine I'll wake up in the morning with his big brown eyes boring excitedly into me and the gift hidden behind his back... and I can't wait! I received Bella's present Friday morning as I dropped her off for the day. 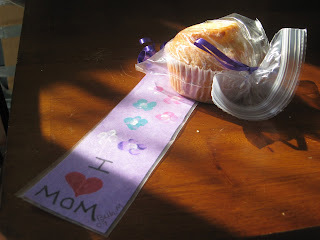 A nice laminated bookmark and delicious cream cheese muffin that I could've eaten at school with her except that I got there right at 9 am ... and that's playground time. I didn't think I should torture Bella by making her sit inside when she could be playing to her heart's content -- especially when she doesn't "get it" yet. But the muffin was delicious when I ate it at home with a piping hot cup of caramel drizzle coffee. Happy Mother's Day to every woman out there who loves and nutures a child -- regardless of whether you get called Mom! I cleaned out half my attic this afternoon ... and at the end I felt like a large, sweaty beast who needed to be hosed down. But half of the attic is clean! And there's a pile of crap ready to hauled off for the Jaycees yardsale. 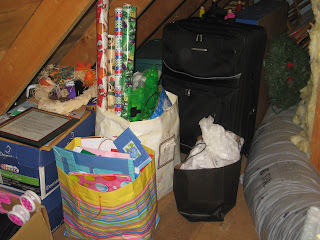 I'm choosing not to think about the other half of the attic that still needs to be purged and organized. But in my travails, I came across about 50 gift bags and more than that many sheets of tissue paper. You can sort of tell how many there are in this photo but there are bags flattened inside of bags, as well as boxes and wrapping paper. So the next time you need to give a gift, please come knock on my door (I'll be waiting for you), and ask me for one (or five)! The point of holding onto them was to re-use them ... I just forgot exactly how many I was holding on to. 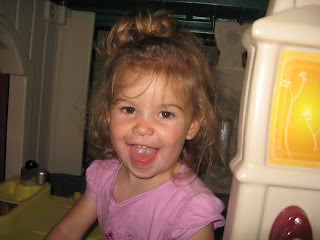 At her birthday party last month, Bella spent as much time in the playhouse as she did the bouncy house. So I couldn't resist when I saw the exact same playhouse for sale on Craigs List earlier this week... and fate worked in my favor because the seller's agreed to bring it to Broadway so we didn't have to drive far to pick it up. Bella loves it! 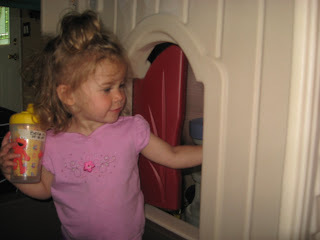 She calls it by it's proper name, MY PLAYHOUSE!, and likes to ring the door bell and go in and out the door. She also really wants Daphne to get inside or at least hang out by the window ... which Daphne refuses to do. We moved the kitchen up to her room and plan to keep the playhouse in the living room until June, when we'll swap them back. That's the plan until we find a bigger house or find a way to rid our yard of fire ants ... I'm sure the new house will happen first. Here's my snugglepuss in her new MY PLAYHOUSE! Stay tuned for a video of her enjoying the new toy. 1. Moved into a girls-only residence hall at UNCG. 2. Joined Coraddi (UNCG's student literary mag) as a volunteer. 3. Visited New Orleans for the first time. 4. Dated the same guy from high school. 5. Learned all about clubbing. 2. Started planning out how Billy and I would buy a home. 3. Celebrated my first year at Eli. 4. Freelanced for Tweak Magazine. 2. Celebrated our first wedding anniversary. 3. Sent Javi off to kindergarten. 4. Worked at an online travel company. 5. Got laid off ... and so began my freelancing career. 1. Celebrated Bella's first birthday. 2. Started working for the Lord. 3. Met up with several wonderful women from iVillage. 4. Ran a voter registration drive. 5. Gave our dog back to the shelter. 1. Spent at least 5 hours writing (work stuff). 2. Helped Javi and Audrey with their homework. 3. Went to dinner with the Lindauers minus Abbey. 4. Read Dora's Alphabet Book with Bella. 5. Took the dog for a walk (the one that's back after a year!). 1. Woke up exhausted from working late into the night. 2. Will grill marinated chicken breasts for dinner. 3. Missed out on a great lunch because of billing screwups. 4. Submited 8 housing articles to my editor. 5. Made plans to buy Bella a playhouse. 2. Pick up the playhouse. 3. Take Javi to the library. 4. Call Eli about the money it owes me. 5. Work in my compost pile. As we've begun doing on Monday nights when I don't have Community Garden, we took the children to Kids' Night at Ham's tonight. Every Monday they have a different character and so far we've seen a blue CareBear, Dora the Explorer, and Mickey Mouse. 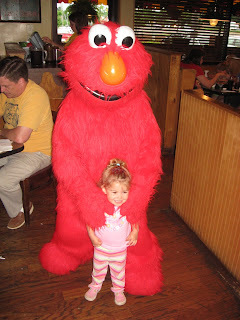 Tonight, Bella lost her mind several times because the character was [drumroll please] ... ELMO! You wouldn't believe the rollercoaster of emotions that result in Elmo standing outside, then disappearing, then walking through the dining area to the patio ... all without coming to see my toddler. She went from glee to sorrow to excitement to frustration. 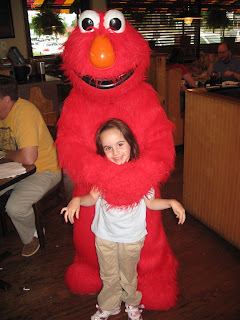 But then all was good because Elmo not only came back (and, yes, Bella was crying, "Come back, Elmo! Come back!") 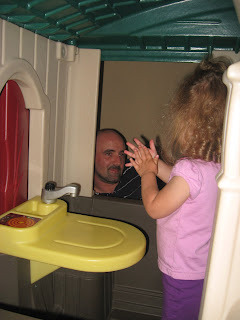 -- he also posed for pictures, gave high fives and hugs, and hung around until Bella had her fill. The Lindauers (minus Abbey) met us out, but only Audrey wanted anything to do with the big red creature. I think some primal instinct in little Ian warned him that huge, furry, fake-looking creatures should be avoided at all costs. Next week the character will be Ernie. But what's Ernie without Bert? I guess we'll find out! Our sweet pup came back to live with us last night. I'm not entirely sure what happened with her new family, but they brought her back to the shelter yesterday around noon. Abbey asked us to foster "a dog," which I thought was hilarious -- but then she said it was Daphne and, of course, we wanted her back! She got here around 11:30 pm, and after piddling on the carpet and jumping around like a kangaroo, she finally settled down for some loves. Not long after she got here, it was time to go to bed. I was worried that poor Daphne had no pillow or bed, but she settled right back into one of our old habits -- slinking under the bed and staying there all night. I slept in a bit this morning but when I woke up it was to the sounds of Daphne pattering around upstairs and Bella squealing "Dap-a-ney!" over and over again. The kids were super excited about having her. They've been loving on her, rolling on her, sitting on her, and sneaking her treats all morning. Bella has also been modeling Daphne's behavior -- so now when we want her to sit, we give her the command and follow up with a treat in the form of grape or piece of canteloupe and she stays right there. What a reunion! 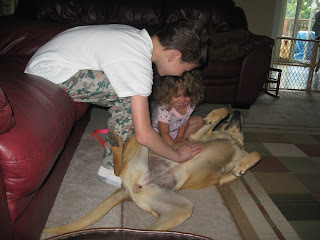 I hope we all remain this enamored of the silly dog for as long as it takes CARA to find her a new home. We're just foster parents with the mission to keep her out of the shelter until someone else wants to take her home. She seems to be enjoying this little adventure! After our regular Saturday-morning gymnastics class, Bella and I spent a couple hours palling around Sanford. First we met up with Amy at the Farmer's Market in Depot Park, where Bella promptly began whining about the "aw-da-bord." 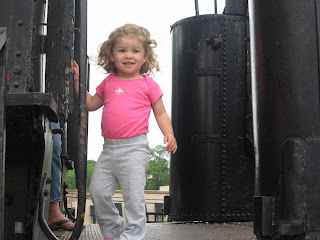 Known as a train in most circles, my child prefers to call it either the "all aboard" or the "all aboard the choo choo train." But then the fun began. 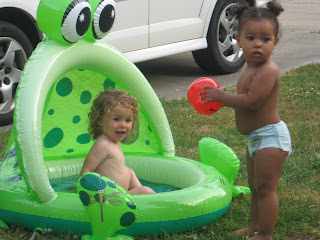 While Billy and Javi headed out to see Wolverine, Bella and I invited Rebecca and her niece Tiffy down to play in the frog pool/sprinkler. The girls spent about an hour romping around, running in and out of the water, and playing with the basketball (which Bella calls "my kee-kah-ball" for some reason). Then I got a call from Abbey saying our sweet Daphne has been returned to the shelter due to some crisis in her new family's life. How could I let her spend the night in a shelter? She's lived with a family since we brought her home as a wee pup. So ... she's coming home tonight. We're waiting for Abbey to drop her off. What's crazy is we're all so excited to see her and can't wait to spend some time with her while CARA tries to find her a new permanent home. All in all, a long but productive and fun day. Stay tuned for pictures of our puppy reunion! I got out of the car with a running mental list of all I need to accomplish today ... but then I heard a bunch of tiny mewls. Just the tinniest, sharpest little baby cries. I could recognize that sound from a mile way. Kittens! But where? I tracked the noise to our boat, which sits in our driveway. 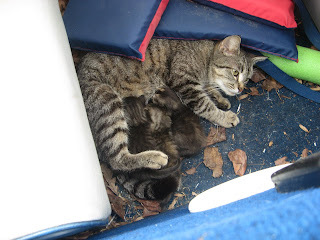 The neighborhood cats enjoy sitting under the boat in the summer, so I figured that's where the litter was hanging out. But they weren't UNDER the boat. They were IN the boat. 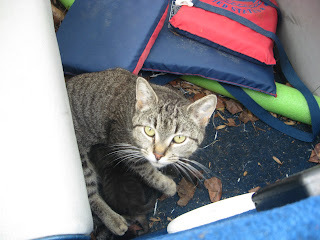 The mama cat apparently snuck each individual kitten up under the tarp we use to cover the boat. The only loose area was up at the hull, but the litter is way at the back. What an industrious mom! I loosened the tarp to take pictures ... plus animal control will need to get in there when they come to pick up the litter. Yes, I called animal control. I love a baby as much as the next person, but this is not the first litter for the mama cat. She's had at least 5 litters since our neighbors brought her home. It may seem cruel, but the neighbors refuse to take care of her or get her fixed ... and we threatened to call animal control after the last litter. I may take a community to raise a child, but it shouldn't to raise your cat! But those babies sure are precious. I'm hoping CARA will come through and save them. At least then they'll all find a great home. Unfortunately, this is kitten season and I know CARA has kittens out the wazoo. Anyone want to sponsor some kitty spaying? !